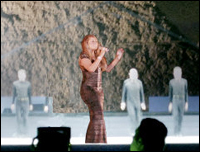 Mariah Carey performed one of her most awe-inspiring concerts yet, thanks to the backdrop of the Giza Pyramids in Egypt. Taking the stage in the middle of the 3 pyramids, even Carey, having performed all over the word for 20 years now, was in awe. It was her first time in Egypt. "Wow! I can't believe I'm standing here," Carey told the crowd of about 3000 executives and VIPs for Etisalat's 3rd Anniversary celebration on Monday. "I mean you guys you're maybe used to it, but us... [pointing to long-time back-up singer Trey Lorenz] that man comes from a town with 300 people only, and and I'm from New York." She kicked off the show with "It's Like That" from "The Emancipation of Mimi", and kept the hits coming, including "Dreamlover", "Shake It Off", "Emotions", and "I'll Be There" with Lorenz. The 13-song set continued with Carey performing her classics, including "Always Be My Baby", "Honey", and "My All". She closed the show with the two ballads "Hero" and "Without You". Last year's "Memoirs of an Imperfect Angel" was relegated only to its lead single, "Obsessed". Carey is also reportedly working on a new album, re-teaming with producer Jermaine Dupri. Dupri helmed her #1 smash "We Belong Together", which Billboard last year called the "Song of the Decade". As if performing in front of the pyramids, which few artists like Sting and Shakira have done before her, wasn't memorable enough, Carey tweeted about putting out an electrical fire just moments before hitting the stage. "In Egypt getting ready to go on stage and suddenly there was a surge of power and an electrical fire started under my feet!" Carey wrote. "Naturally, my emergency instincts kicked in and I put out the flames with a towel. But other than that the trip was a smash," she said.